eBay.in is one of the leading online websites in India. eBaynow offers Sandisk 16GB USB pen drive for Rs.79 only for the customers who are transacting for the first time in eBay. Sandisk 16GB pen drive has 5 years manufacturer warranty and it is one of the most selling pen drive in India. The original price is Rs.449. eBay offers it for Rs.79 for first purchase in ebay.in. 2. Enter your valid contact details. You need to enter your 10-digit mobile number and your pin code. 3. You will receive a SMS with coupon code and activation instructions on 6th October 2015. 4. 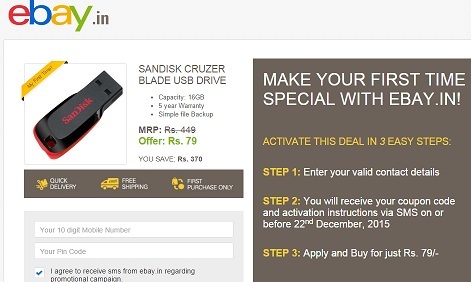 Follow the instruction and apply the coupon code to buy the Sandisk 16GB pen drive for just Rs.79/- only. 1. Offer is valid on First come first serve basis only. 2. Limited stock only. So, hurry and register. 3. eBay's terms and conditions are applicable. 4. If the user is not a first time transactor in ebay, he/she will not be able to utilize the offer. 5. Manufacturer gives 5 years warranty for the USB drive. 6. It will not be covered under eBay gurantee as it is covered under manufacturer's warranty.